Yup, I had seen them everywhere too and I was a little bit skeptical about the whole cold oatmeal thing at first, but after making this, I’m a convert. After all my trial and error, I think the key is to add lots of fruit so it’s not too heavy. I’m a new lover o’ mangoes so I will likely give this baby a go. I’m feelin’ tropical! You could throw some pineapple in there too and make it Hawaiian! This looks so yummy and easy. I like easy! I’ll have to give it a try. It doesn’t get much easier than this–I think it probably takes the same amount of time as instant oatmeal! Gorgeous photos — as I said on Facebook, I purchased nearly all the same ingredients last week to make this for my son (lactose intolerant and a lover of coconut/mango) but I hadn’t gotten around to it. Glad to hear it worked so well! I think he will love it. 🙂 The mango makes the oatmeal so sweet without adding a lot of sugar–he won’t even know it’s healthy! Ohhh- I definitely have been looking into overnight breakfast recipes lately and this sounds fab! I’m not a huge coconut fan though, so I might trade it for something else. I’m also not big on almond milk… does the taste come out strong in this? Well, you don’t have to use almond milk–soy milk, dairy milk, or whatever else you have on hand would be fine! I’ve tried overnight oats a couple of times and had mixed feelings about the results too. I haven’t tried them in a long time though, so maybe its time to give them another chance – this version definitely sounds like a winner! I’ll keep my eye out for champagne mangoes too, since I can never seem to remember which types of mangoes I like better than others! Typically, I kind of have to make myself eat oatmeal–it’s one of those things that I eat because it’s good for me, not because I really love it. But this oatmeal is different! I think it’s the mangoes. 🙂 I just want to eat it everyday! I had some extra mango from a recipe I made last night, so I used it to make this! You’re right, this was so good, and different from other kinds of overnight oats. 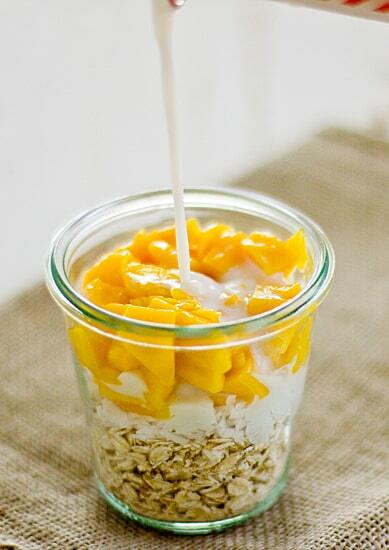 I put lots of ripe mango in it, so that every bite had a good mix of mango, coconut and oats….yum! This is a much better way to eat oats in the spring/summer rather than hot oatmeal! TMJ is just awful. 🙁 And my love of crusty French bread doesn’t help! Well, if you do make overnight oats, definitely go with the rolled oats and not the steel-cut ones! I’ve never even heard of champagne mangoes – I must look for them! Did you intentionally cut one into a heart in the first picture? It looks so cute! Oooh, this would be a nice change from my normal cinnamon-banana oatmeal. I don’t think I would like mangoes, something so refreshing, in hot oatmeal, but in these chilled overnight oats I think they would be wonderful! Oh my word! This looks absolutely amazing. I love making overnight oatmeal. I’ve never tried mango in my oats. This will definitely be a nice treat! Thank you for sharing! This sounds like my perfect breakfast – I love all the ingredients! I might even sub out coconut milk for almond because that’s what I have on hand and I love coconut so much! Do you have that refrigerated coconut milk or the canned kind? Because I was thinking about buying the refrigerated coconut milk for this. I haven’t tried it yet! I have the refrigerated kind – So Delicious. But I actually like the Silk version better since it’s more coconutty. My mom is a soy drinker and I converted her recently. Now I kinda feel guilty that I bought a couple of those mangoes and let them go bad 🙁 I will definitely try again because I literally eat oatmeal every morning – but have never heard of this overnight thing. And you used almond milk, yay! This looks so good! I’ll have to try it. I’m surprised you have TMJ issues with steel cut oats, I do overnight oatmeal with steel cut oats (I’ve never heard of not cooking them though…so, you bring to a boil and then remove from heat and cover all night) and it ends up way creamier and smoother than any other oatmeal I’ve ever had – no chewing needed. Thank you! And yes, steel cut oats without cooking–I based them off of this recipe: http://www.thekitchn.com/simple-breakfast-nocook-overni-125986. If I make them again, I am definitely doing it your way! 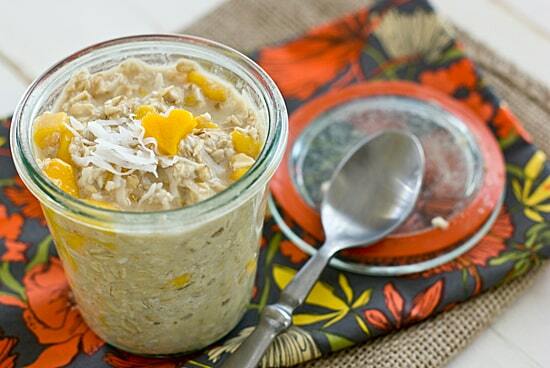 I have seen these overnight oats all over the Internet and they look sooo good. I just won a whole case of mangoes so I will be definitely giving these a try. I did! Can you believe it? I like fruit; but like you, I have to make myself eat it most of the time…..except for mangoes, grapes and watermelon. I could live off of those…particularly the mangoes. I picked up some almond milk at the Coop this afternoon. I’m going to be having this oatmeal for breakfast this week. Yum! Blackberries sound good! Have you tried it with fresh pineapple? I haven’t! But I wonder if the enzymes in the pineapple might break down the oatmeal overnight. That might be better to add in the AM? Or do the enzymes only break down proteins? Never heard of overnight oatmeal before. This would be great for me to grab on the way out the door to work. Thanks for sharing. It’s great for a quick breakfast because you do all the work the night before. I’ve seen other recipes with blueberries, bananas–you can do just about anything! This looks fabulous! We have been loving overnight cold oatmeal since last summer. I was shocked when everyone liked it. We have soaked in dairy milk, yogurt and water and almond milk. We love to add chia seeds! Can’t wait to try your version. Thanks for sharing. I think now that I’ve had oatmeal cold, I actually prefer it that way…. Where do you get those adorable jars?!?!?! Hi! I recently found your blog!! I made this last night. I ended up using raspberries because I didn’t have apricots and no coconut either, but a little bit of agave. Let it sit overnight and then in the morning added a few blueberries. Was delish! Okay, loving what I’m reading. My question is about oatmeal. I have Quaker 1-minute oatmeal, is this what to use? Instead of nectar, I’d like to use pure maple syrup, what do you think? Could you use frozen mangos and let them thaw in the mixture? I think that would be fine, but I haven’t tried it myself so I can’t say for sure! Found this via a repost in the blogosphere. First time I’ve heard of overnight oats. Going to put away the instant oatmeal and give this a try!! Thank you for sharing! This looks good and it’s super easy…need to try this!